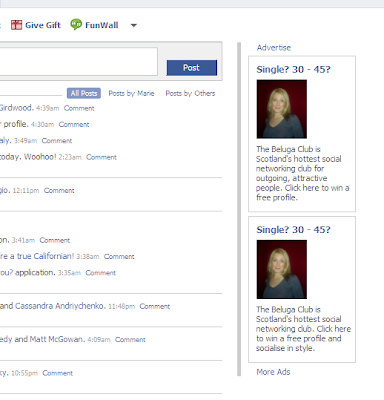 The new Facebook doubles the graphic ad slots. We go from one ad on the left to two ads on the right. You can see that Facebook is double serving me the same dating ad. I'd be pretty annnoyed if I was the advertiser - especially if I end up paying for two impressions. If I'm only paying for one impression then Facebook just cut their ad revenue by %50. Oops! Facebook always targets dating ads at me. Clearly it thinks digital marketing men in their 30s should be hot chicks. I agree. Facebook sent out the following email to advertisers to explain the new ad system. but let's also take a deeper look into what the new design means for you. remain the same, but they will be located in a different part of the page. way. As many as two ads may show at one time on any given page. to evolve and improve, we'll provide more details. our advertising products as effective and useful as possible. Nice find there Andrew. I'd seen others discuss this development but donno of anyone catching this point.